Sifting through the Mitchell Report while apologizing to Dan Duquette for all the snide "twilight of his career" jokes through the years. I hope the Duke is savoring his hour of redemption . . . While all of this makes for juicy (no pun intended, honest) gossip and compelling reading, I have a hard time getting worked up by George Mitchell's "findings"; hell, to me the most shocking developments in the report were that Nook Logan's real name is Exavier and that Roger Clemens was too a-scared to stick a needle in his bellybutton, the big sissy. Exavier - that's just some awesome naming skills by his mom. Otherwise, this thing was short on genuine revelations, and pretty damn far from complete; as far as I can tell, Mitchell's four primary sources were Kirk Radomski, the Jason Grimsley case, the BALCO scandal, and one of those online pharmacies the Feds busted. The tip of the iceberg? Hell, that's not even an ice cube. 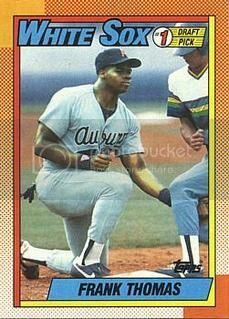 Anyone with clear eyes and more than a shred of common sense realized seasons ago that the use of performance enhancing drugs in major league baseball was approaching epidemic proportions. (To no one's surprise, Bud Selig, who wore his familiar look of permanent constipation yesterday, was not among those with a clue.) And while the names Clemens and Pettitte and Tejada were splashed all over the news yesterday, their involvement in PEDs really wasn't news, per se. It was merely a confirmation of accusations, rumors, and innuendo we've all heard before about those particular players. What was interesting was the amount of never-weres and who's-hes? on this list. Phil Hiatt and Adam Piatt? (I always thought they were the same guy.) Bart Miadich? (Who?) Adam Riggs? (And you are?) In a way, I feel for these guys, the anonymous minor league lifers who tried the stuff out of desperation to secure a big league job and the life-altering riches than can accompany it; juxtaposed with another headline on ESPN yesterday - AROD, YANKEES FINALIZE $275M DEAL - the by-any-means-necessary approach makes all the sense in the world. I'm not saying it's right. But I'm not saying I wouldn't have done it myself, either, if my dream was so close and yet so far. I think I've made my fanboy admiration for Peter Gammons plainly obvious here during the three years this blog has existed. I've often said that I am in the business in large part because of the happiness his coverage of the Red Sox had on me as a kid, and to have him become a friend of this site is one of the unexpected bonuses of this gig. So it's . . .. disappointing to see him acting as a blatant and blind apologist for the players. Yesterday, in an apparent attempt to puncture holes in Mitchell's credibility in any manner possible, he actually said he expects there will a be a lot of defamation lawsuits. C'mon now, Commish. You know how many defamation lawsuits there will be? Just as many as there were after Rafael Palmeiro threatened one when he was caught: Zero. Sadly, Gammons and a number of his peers put a higher priority on protecting their own interests, namely a level of access granted only to the true insiders, than they did on protecting the greater good of the game. I put Tim "See No Needle, Hear No Needle" Kurkjian in the same category, too, and even today, in a column that was typically entertaining and balanced, Jayson Stark gave the benefit of the doubt to players who do not deserve it. Only Buster Olney, who admitted to his embarrassment over his profession's culpability in this a long time ago, seems concerned about maintaining journalistic integrity. Which brings me to their employer. I suppose I shouldn't have been surprised that ESPN barely acknowledged its uncomfortable proximity to several aspects of this story - John Kruk was a teammate of Lenny Dykstra on the notorious '93 Phillies, Steve Phillips was the Mets' freakin' GM when Radomski was apparently running a CVS pharmacy out of the clubhouse, and "Baseball Tonight" analyst Fernando Vina was actually named in the damn thing. I'll say this for the so-called Worldwide Leader: they are incredibly adept at covering a story and covering their own asses at the same time. "The scout, Mark Delpiano, responded, Some digging on Gagné and steroids IS the issue. Has had a checkered medical past throughout career including minor leagues. Lacks the poise and commitment to stay healthy, maintain body and re invent self. What made him a tenacious closer was the max effort plus stuff . . . Mentality without the plus weapons and without steroid help probably creates a large risk in bounce back durability and ability to throw average while allowing the changeup to play as it once did . . . Personally, durability (or lack of) will follow Gagné." Gagné was atop anyone's list of suspects - he went from a doughy fifth starter type to a pumped-and-jacked terror of a closer overnight, then suffered the requisite ligament, tendon, and back injuries often associated with PEDs - and it's funny how the Sox scout basically attributes all of his success to steroid use. Forget knowing what we know now about Gagné. Knowing what they knew then, why did they ever trade for him? And how much buyer's remorse is Doug Melvin having at the moment? Brendan Donnelly might be slightly embarrassed about this whole thing, I suppose, but I can't imagine he will ever have a moment of real regret. Think about it. 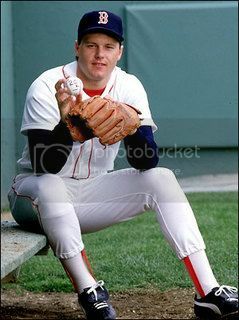 Here's a guy who bounced around every conceivable minor league for 10 seasons, pitching in such whistlestops as Chattanooga, Nashua, Altoona, and Winston-Salem, without ever getting a shot at the big leagues other than an ill-considered stint on a replacement roster during the '94 strike. But out of nowhere, at age 31, he gets called up to the Angels in '02 and puts up a 2.17 ERA for the world champs, then the next season posts an astounding 1.58 ERA in 63 games. Hmmm. It's pretty clear he did something around that time that dramatically altered the course of his career, a career, we should mention, that has netted him $3,470,000 as a big leaguer. Something tells me the pay wasn't quite so good as an Arkansas Traveler. It's fair to say Donnelly never would have established himself as a major leaguer had he not decided to get some chemical assistance. 1. Mitchell did nothing but give me 100 percent confirmation what I was 99 percent sure of since, oh, 1998. Even elite athletes rarely improve their performance in the 30s, and they never continuously improve their performance from year to year. Clemens's statistics from the last decade are nothing but a numerical compilation of lies. 2. Clemens belongs in Cooperstown, as does Barry Bonds, simply because I feel they were both locks before they apparently began taking PEDs. I know it's a flawed argument, but I don't think there's any other logical way to look at it at this point. 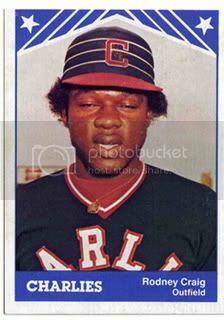 On their plaques, however, the word "steroids" should be prominent, and their heads should be twice the size as those on any other plaques. 3. Clemens is so compulsively dishonest I don't think he knows what the truth is half the time. I don't take steroids . . . it's not about the money . . . I thought it was the baseball . . . Will McDonough had it right all along: he's The Texas Con Man. What a world-class fraud. 4. Andy Pettitte is one Yankee I've always respected, but as the admirably warped geniuses at Fire Joe Morgan are reveling in pointing out, he's just as big a phony as his buddy Roger. Pettitte was one of several members of the dynastic Yankees who was named in the report, and will some will say that taints their legacy (man, has that phrase become too familiar), I'm reluctant to believe that there were more juicers in the Bronx then there were in the clubhouses at, say, Camden Yards or Fenway Park. It just happens to be that the Yankees players were the ones who have been busted so far, due mostly to the fact that Jason Grimsley was a teammate. To put it another way - save for El Guapo, I believed every name on that erroneous list that was floating around the internet yesterday before the report was revealed, and I don't think that makes me gullible, but rather realistic. 5. Suzyn must be devasted. Maybe John Sterling should bring her some Kleenex. 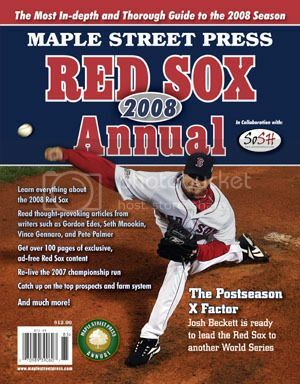 Given what we now know about the era during which he was the most dominating pitcher we've ever witnessed, the accomplishments of 5-foot-11, 170-pound Pedro Jaime Martinez's accomplishments grow more impressive by the year. 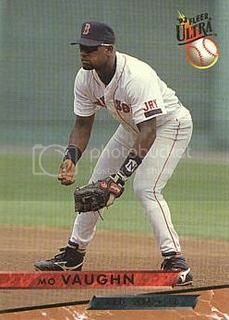 I'm not shocked that our old pal Maurice was among the users outed by Mitchell; I'm not the only one who's long held suspicions about some prominent members of the Kennedy/Canseco Sox teams, so if there was any surprise it's that Mo apparently waited until later in his career to start trying PEDs. Sadly for him, he apparently and unwittingly took the kind that increase your waist size and slow your bat speed. I always assumed it was the endless supply of chocolate glazed that did that.